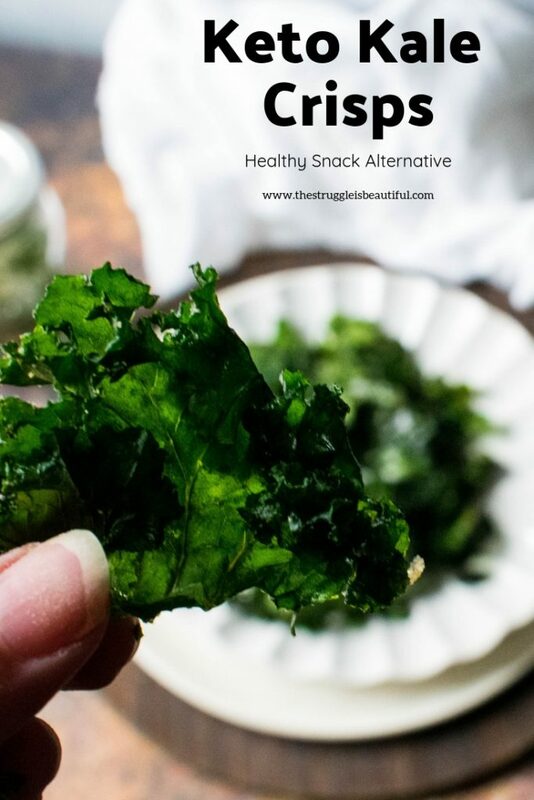 These Crunchy Keto Kale Crisps are a great snack, side or appetizer! They’re a tasty way to get in those healthy greens, and great for anyone trying to watch their carbs. 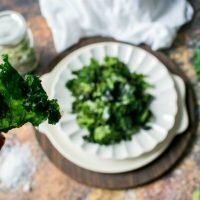 This crispy kale dish is a great alternative to traditional chips for anyone doing a keto or paleo way of eating. For more awesome easy low-carb snack ideas, sign up below to get our free Keto Snack Guide. Right after high-school, I moved to the city (Austin, Texas) for college. I was a small town girl, who didn’t know anything about the real world. When I started to run low on cash, I found a job at a cool restaurant called Jazz on Sixth. It had live music on Saturday nights, great food, and a cool, older crowd. I was their newest and youngest hostess. It was a cool job for a girl my age, but I was a fish out of water. I was the youngest employee, and I felt like the most naive. They hired me and immediately sent me home with a huge binder full of things to memorize: table charts, menus, ingredients, the difference between julienned and diced vegetables, etc. I loved it all, but it was all so very new to me. My household growing up, was not a “foodie” home. My mother hated cooking. I didn’t even know there was more than one kind of lettuce until that binder. Everyone’s first shift was to sit in the back of the restaurant, and “taste” all the food that came out. This was a really great idea. Everyone that worked there had tried all the food. It was super exciting and also super intimidating. You see, one of the most popular dishes was raw oysters, and I was TERRIFIED to try them. One of the first tickets to come out was for fried fish. The fish plate came with 2 large fish fillets, french fries, hushpuppes and dipping sauce. So, when they set out a plate with huge piece of bright green lettuce on it, I was confused. Now, mind you, this was fifteen years ago, and Kale was not what it is today, and it definitely wasn’t one of the kinds of lettuce I was learning about it my packet. “It’s a garnish.” He replied with a little more disdain than necessary. Flashes of Tom Hanks scraping all the caviar onto his plate, while Meg Ryan yells at him, “That caviar is a garnish!” popped into my head. “I guess, you could, but it’s gross and bitter.” Steve replied. After that, Steve loosened up a little bit, but I didn’t. I was still super-nervous about the oysters. I was on edge all-night, but by nine o’clock not a single oyster plate was ordered, and I was off the hook. Fastforward 20 years, and everybody and their mother is now eating Kale. We’re eating it raw, blended into smoothies, boiled, chopped, anyway we can get it. America has gone crazy for Kale. Time magazine has even hailed it as a super-food. It is rich in vitamins, antioxidants, and fiber. I’ve tried Kale several different ways, but hadn’t ever been able to get over the “gross bitter” taste that Steve had told me about all those years ago. Finally, I discovered kale crisps and developed my zesty ranch recipe. I use this recipe as a healthy alternative to processed crunchy snacks, and even my kiddos love them. I love this Ranch Seasoning Blend and use it in many recipes. I suggest you make a big batch and keep it on hand for recipes like this and these awesome zucchini chips. This step is easiest when you buy the whole leaves of kale. You simply use your hands to pull the hard “rib” out of the kale. The rib part is really tough, and has the most bitter taste. While your pulling the leaf off, you can also break the leaves into smaller size pieces. If you buy the pre-chopped kale, it is almost impossible to dig through the pieces to find the ribs. Learn from my mistake, I’ve bought the pre-chopped kale many times, trying to save time, and in reality it does not. 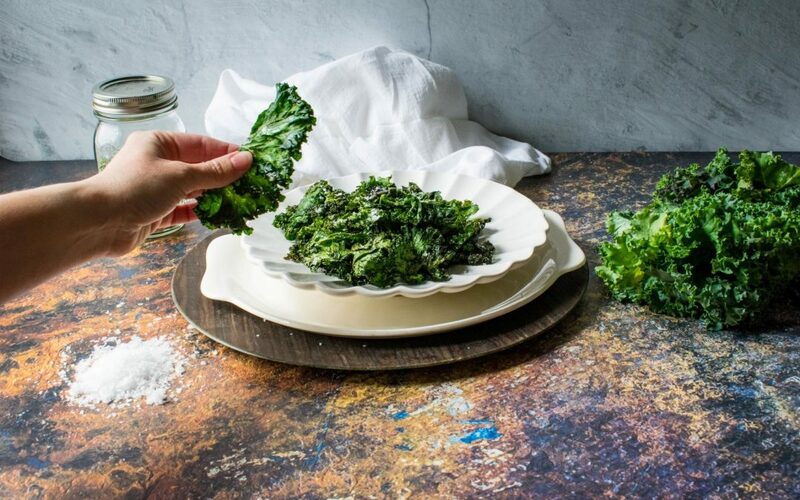 To Season the Kale, use a large bowl with a lid. Measure the Kale into the bowl, then drizzle the olive oil on the kale. For this recipe I use 4 ounces of kale, by weight not volume. If you use it’s about 3 cups loosely packed. Then, put the lid on the bowl and shake it vigorously to make sure the oil coats the kale compltely. Next, sprinkle the ranch seasoning on top of the kale, close the lid and shake vigorously again. Make sure the seasoning has evenly coated the kale. First, line your baking sheet with parchment paper. Then, spread the kale very thinly out on the baking sheet. Make sure they are in a single layer, and as flat as possible. Finally, Bake at 275 for twenty minutes. I have found that this recipe is one you have to be very careful with. It has a very short “sweet spot” where the kale is just right. It’s one of those foods that goes from not-yet, to oops-too-much really quick. So, if you decide to go longer than the 20 minutes just keep a watchful eye and set a timer to remind you to check back on it. 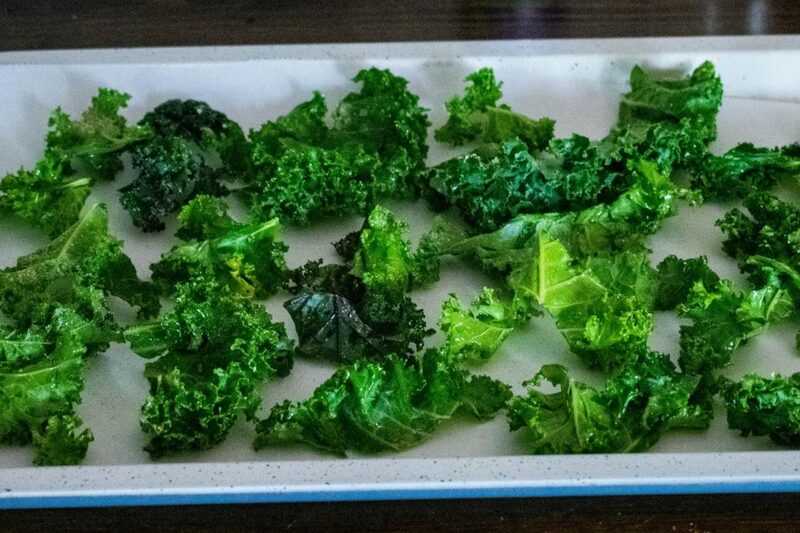 These Keto Kale Crisps are the perfect low-carb snack. They provide those on the keto diet with a satisfying crunch similar to a chip. Pre-heat oven to 275 and line baking sheet with parchment paper. Drizzle 2 tablespoons olive oil over kale, and coat completely. Add ranch seasoning blend, and coat completely. 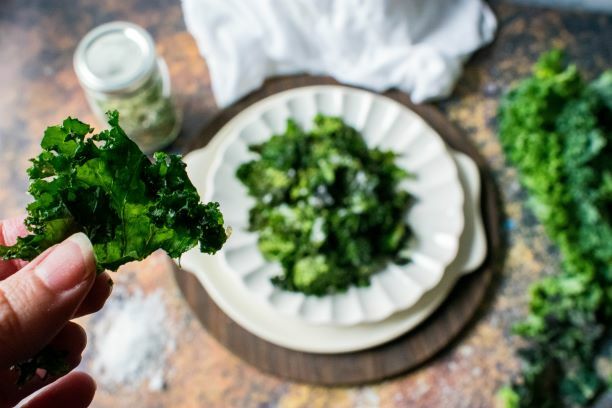 Place kale in single layer on lined baking sheet. You can also try these Keto Kale Crisps with other seasoning blends or even just salt and pepper. Let me know your favorite seasonings in the comments below.